Snickers worked with AMV BBDO & Mediacom to produce a search campaign that tied in with their ‘You’re not you when you’re hungry’ campaign. The concept was to bid on commonly misspelt words with an advert reading “Grab yourself a Snikkers” as “Yu cant spel properlie wen hungrie”. Without seeding, the campaign smashed their target of 500,000 people within just three days of launch – showing that with a little creativity, search continues to throw up opportunities for increasingly cost-effective marketing. As the PPC budget was being used on misspellings, naturally not nearly as competitive as the actual brand terms or popular keywords, Snickers was getting more bang for its buck. Mondelez recently used Facebook to reinvigorate its Nilla Wafers brand and boost sales. 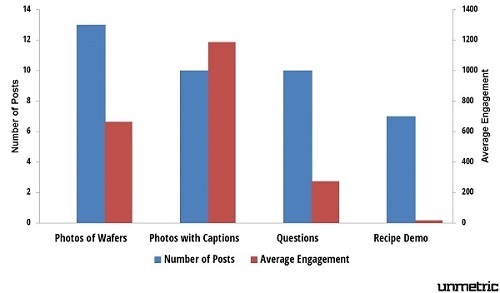 A study showed Nilla Wafers sales increased 9% in test market locations among consumers who saw Facebook ads versus a control group of consumers over the course of a five-month campaign. 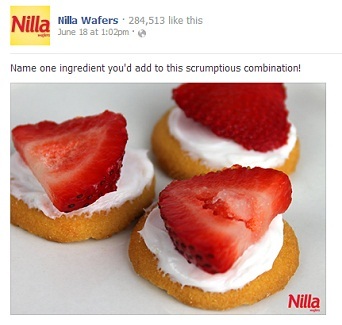 The Facebook ad campaign for Nilla Wafers also was able to reach 11.3 million households through 190 million total impressions (16.8 impressions per household). 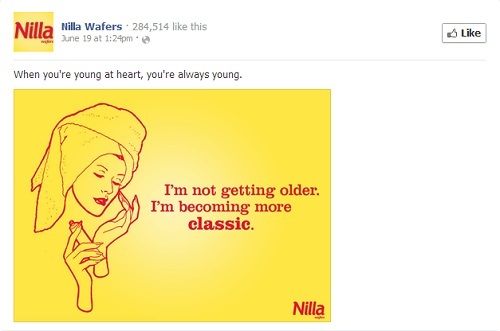 68% of Nilla Wafers’ fan base on Facebook is female and it looks like the brand has done its homework to understand the type of content that will resonate with this target audience. Back in 2012, Bel Group's popular cheese spread Picon wanted to revamp its brand promise of 'spreading happiness' across Lebanon. The FMCG brand’s civic activism programme became part of the country’s school curriculum via some smart digital marketing. Each area of civic activism was represented by a Lebanese superhero, who represented the programme as an ambassador and spoke about the effort to the media. Kids became proud to affix another badge to their Picon sash would be more inclined to eat a sandwich spread with Picon at lunchtime. Picon developed 'Happiness Heroes', a programme that taught civic education to school children and allowed them to apply those lessons outside of the classroom through civic works projects. The campaign reached 6,700 students. Together, those students collected two and a half tons of bottle caps, recycled two tons of paper, and planted 1,250 trees. The students also helped 158 families in need, entertained 2,000 seniors, renovated 15 public schools, and helped 550 people with special needs participate in sports events. Picon estimates that the company garnered $1.8 million in earned media and reached 2.5 million people. In 2012, Lebanon's Ministry of Education announced that the Happiness Heroes programme would be integrated nationwide. In the space of four years, Smart Balance managed to grow its US market share by 14%, giving power brands such as Flora, Country Crock and I Can't Believe It's Not Butter! something to worry about. 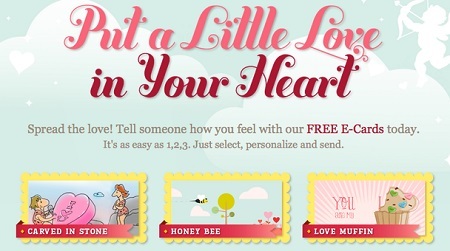 This case study looks at how the health food brand made smart use of digital platforms, culminating in this years' s Valentine’s e-cards promotion that boosted subscriptions 14% in the process. 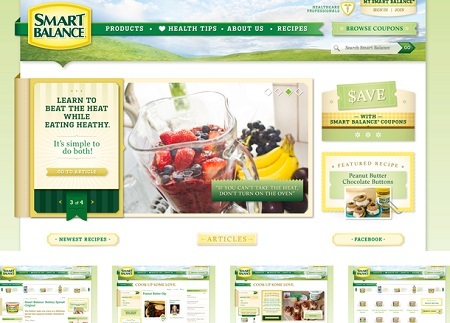 Back in 2010, Smart Balance hired agency TBC to push its line of heart-healthier foods. 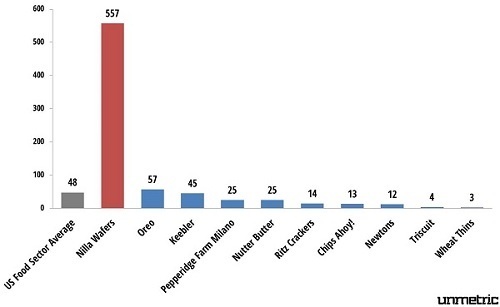 The brand operated in a highly competitive area with rivals investing more than double Smart Balance’s marketing budget, such as Unilever’s Flora and Shedd's Country Crock. The Smart Balance site was languishing and had experienced declines in many important areas. Because of this, TBC was awarded the redesign project for SmartBalance.com. The project was to be much more than a re-skinning. TBC would implement a new, open-source Content Management System and bring day-to-day operations into the Agency. In addition to creating a fresh look more in-line with the brand, TBC introduced new health/nutrition content, recipes, seasonal promotions and coupons, and streamlined navigation across the site. In 2013, site visits were up by 42% and time spent on site has increased 27%, while bounce rates decreased by more than 16%. And along the way, several thousand coupons were delivered and the Smart Balance email database grew over 15-fold. To keep up the momentum online, in February 2014 TBC created a free Valentine’s Day e-card promotion for Smart Balance in observance of Heart Month. The promotion was developed to strengthen user engagement on the website, create a relevant brand presence during Heart Month and grow Smart Balance’s database of emails for future re-marketing efforts. The campaign yielded a 112% increase in site traffic (year over year), a 42% increase in average time spent on site, a 53% decrease in bounce rates and a 15% increase in newsletter subscribers. Overall, the continued brand advertising turned the buttery spread category on its head and helped Smart Balance to become the #2 brand in the category, behind Flora.